This post is brought to you by Emma Dines! 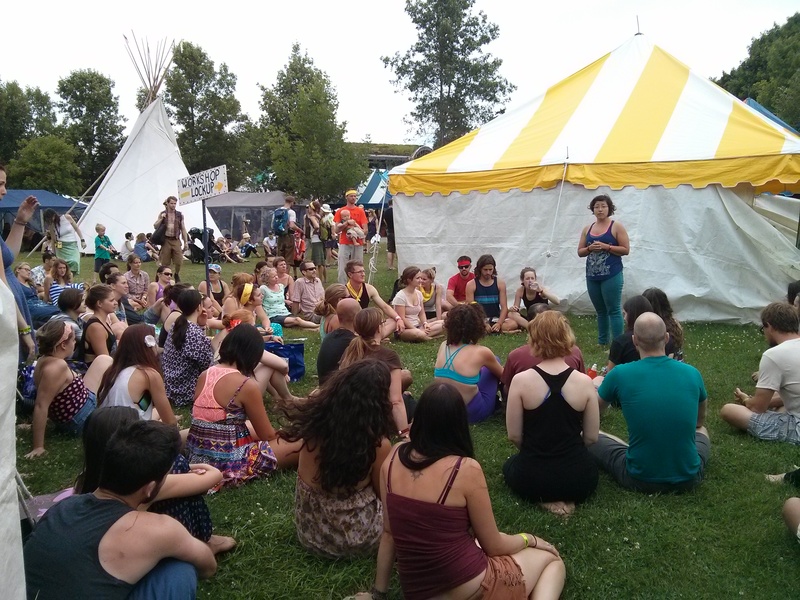 If you’ve never been to the Hillside Festival in Guelph, you are missing out. This weekend festival that takes place on in late July on Guelph Lake Island has become a beacon of environmental sustainability, creative expression and wonderful music. Where else can you find crocheted covered bicycles, workshops happening every hour of the day on everything from home fermentation to hula hooping, with incredible musicians and poets performing on four different stages? In March of this year, I began hatching my plan to offer a unique workshop at Hillside. Workshop spots are coveted by many people, as being selected to offer a workshop means a complimentary weekend pass and a chance to contribute to the magic of the festival. I had submitted workshop proposals a few years in a row (without success) but this year I felt like I had a royal flush. I submitted a proposal for Acrobatic Partner Yoga, and then sat back and waited. Plain old yoga workshops were a dime a dozen, but I hoped that I would be the only one submitting this particular workshop topic. In April, I got the good news. I had been selected! I worked on my workshop description and waited until July. The big weekend came. My workshops were set for Saturday at 3pm and Sunday at 2pm. I was a little bit nervous. There were so many cool workshops. I hoped there would be at least 15-20 people come to try out mine. 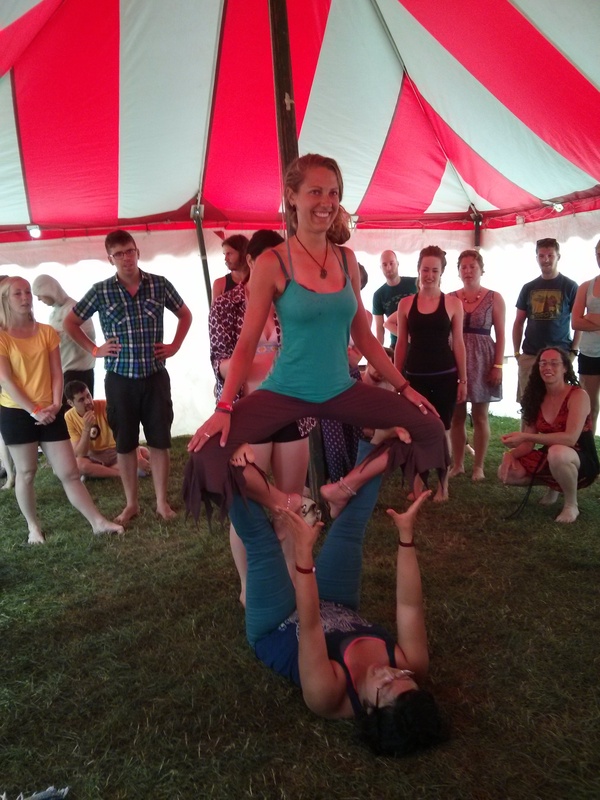 On Saturday I was walking towards the Active Living Tent where my workshop was to take place and I heard some people consulting their festival guides and saying “Let’s not be late for Acrobatic Yoga – it’s coming up soon!” I was tickled. Whew! I thought. That’s at least five people. I got to the tent, checked in with the workshop organizers and waited. People started arriving. And arriving. They filled up the tent. They filled up the grassy area next to the tent. They filled every last spot of grass that we had. I was dumbstruck. Were all these people here for my workshop? The volunteer that was assisting my workshop informed me that there were 80 people there. Was I ready to start? I took a big breath, and jumped in. The workshop ended up being super fun, though a little bit chaotic. Some brave people volunteered to demonstrate the acrobatic flying mounts for the whole group – which I taught them on the spot! People walking by the workshop got interested and started joining in on the fun. It was a hilarious jumble of lifting, giggling and learning. My favourite thing about sharing Acrobatic Yoga with people is the gasps that people make when they see someone go up into a pose for the first time. I forget how neat the basic poses look, because they are so familiar to me. When I was doing some demonstrations of poses, there were a few times when I would lift someone up into front bird or throne pose, and everyone watching would gasp and then applaud. 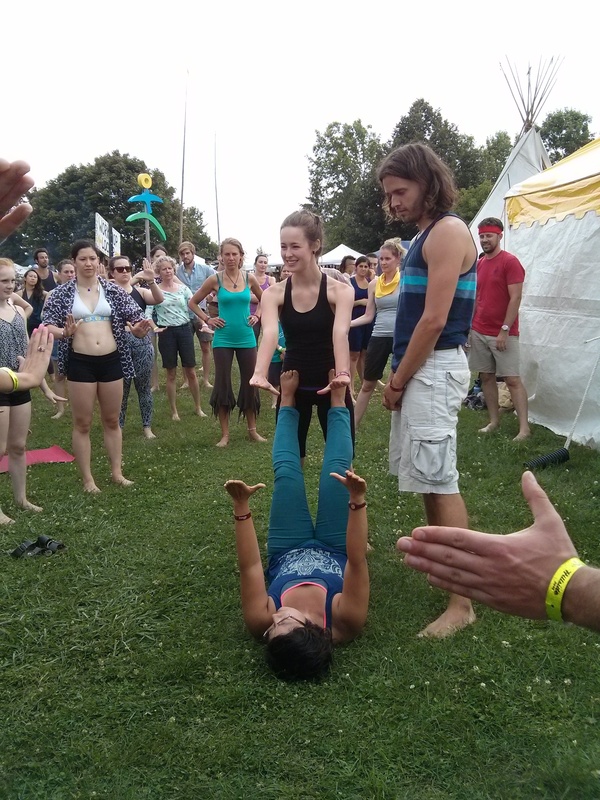 It’s been a while since we’ve offered Acrobatic Yoga at Queen Street Yoga, but this experience at Hillside definitely got me hooked back into sharing this practice. I got back from the festival on Sunday night and on Monday afternoon Leena and I added an Acrobatic Yoga workshop to the Sept-Oct schedule. I am looking forward to beginning to build a community of flight! Join Emma on Saturday Oct 5 from 1-4pm to learn the FUNdamentals of Flight: An Introduction to Acrobatic Yoga. No partner necessary, register here! Emma Dines is the manager of Queen Street Yoga. 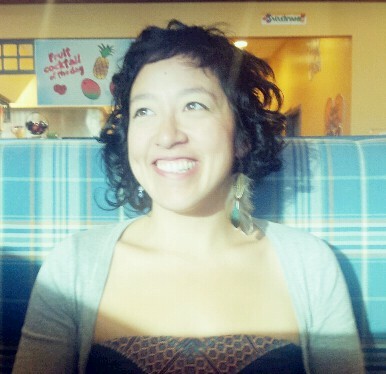 She loves writing about yoga, visiting thrift stores and going for walks in the woods. She also loves cartwheeling, sewing and making her own kimchi.